It was Dr. Alfred Adler (1870-1937), an Austrian psychoanalyst, who first brought the (possible or potential) effect of birth order to light. He suggested that birth order has a strong affect on a child’s character. 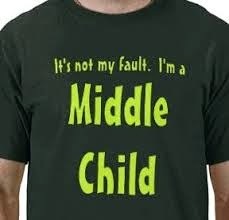 Middle-child syndrome starts when the middle child is squeezed between the oldest and the youngest in their family and have often trouble finding their own 'niche' in the family. The eldest will sometimes become the overachiever, while the youngest, the benjamin, will forever been regarded as ‘the baby'. Middle children will sometimes misbehave to get attention. Dr. Adler was a middle child himself. So, he would know.